In the words of Winston Churchill, “We make a living by what we get, but we make a life by what we give.” By this measure, Earl Haugabook has made an exceptional life. Earl has devoted decades to the West Tampa Chamber of Commerce and is now retiring from active service. Few can match Earl’s many contributions to West Tampa and the Tampa Bay community. Earl’s has truly been a life of service. He joined the Air Force at 19 and served for 20 years. His last post was MacDill Air Force Base and he chose to remain in Tampa. Earl then joined TECO where he enjoyed a distinguished 27-year career. 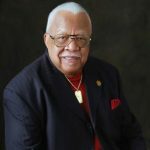 During his time in the military and at TECO Earl earned his Bachelor's and Master's degrees in Business Administration, studying at various institutions and completing his degrees at St. Leo University. All during his demanding career he also undertook an amazing schedule of community service. He got involved with the West Tampa Chamber through Tony Garcia whom he knew from his time at MacDill. And the rest is West Tampa history. Earl didn’t just join the West Tampa Chamber, he immersed himself in it. He chaired committees and ultimately rose to President (1997 & 1998). Some of Earl’s favorite Chamber activities included the Christmas programs, the luncheons, and the Flavor of West Tampa. He especially enjoyed talking to prospective members and getting them to join and modernizing Chamber operations. Chamber work must be in his blood as Earl has served as President of both the Brandon and Seffner Chambers. He was also active in the Greater Tampa Chamber of Commerce and chaired its Military Affairs Committee. Although a long-time resident of Brandon, Earl worships in West Tampa as a member of the First Baptist Church of West Tampa where he is a deacon and chair of the Board of Directors. As if all this isn’t enough, Earl is an active Shriner, serving as President of the Oasis chapter, Overseer of the 5-county area, and Florida Convention Director. Earl has come a long way from his birthplace in Montezuma, GA. In case you’re wondering where he got his impeccable taste and sense of style, he studied the tailoring and dry cleaning trade in his youth and it still shows. Earl is the loving husband of Ann and very proud father of 4 children and grandfather of 5. A true gentleman, friend to all and forever cherished honorary member of the West Tampa Chamber of Commerce – we love you, Earl. We are so happy your health is improving. May you enjoy many happy years in retirement. You’ve earned it!